"You do not need a University Degree or to be born with the gift of Drawing – you only need 10 minutes every couple of days and These Books to become an Artist… "
"Draw cartoons like an Expert." this could be the most important message you've read all year. 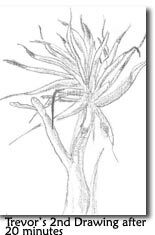 You'll soon discover how to create drawings that are skillful and fascinating ... artworks that are uniquely yours, professional, and a pleasure to display. You won't be frustrated by trying to transfer your ideas from your thoughts to your canvas waiting for your creativity to get into gear. You'll soon see the ability to draw is a skill that can be learned. So what have I done that qualifies me? 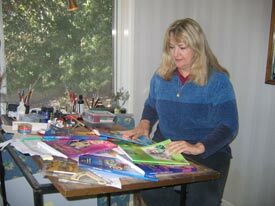 I am an Author and Illustrator – with published works commissioned by several publishing companies. I also write Design, Multimedia and IT Courses for colleges and schools. Project Manager and Editor of a prize-winner in the Asia Pacific I T & T Awards. A Message from a Student. These workshop manuals begin right at the very beginning. Here’s a simple case study in picture format. So just how do you develop this all important confidence? There are great art classes you can attend but many people are too embarrassed by their level of skills to front up to an art class. Why did I write these books in the first place? 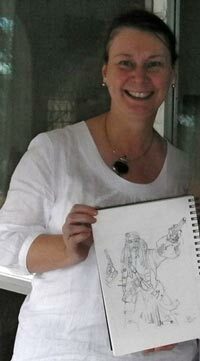 I was illustrating a set of books for a publisher who asked me how I became so good at drawing. I told him. I wrote the series. I hold the electronic rights. I now make this series available to you at a fraction of the cost of the printed books and I’ve added some other goodies to go with. The concept is to allow you, the student, to draw what you see or what your “mind’s eye sees”. I spent over two years documenting the methods that I teach and how to best get the fundaments across to students without needing me to be present in person. This allows for everybody to have the same beneficial instruction no matter where you are. Draw they did, and have gone on to learn more by raising their level of skills in order to feel confident enough to attend regular art classes, which had previously seemed too daunting. The desired effect was that I wanted everybody to be given the best opportunity to bring their drawing and sketching skills to the fore. To draw with a pen, now that requires a set of skills far above the confidence level of most artists. You can learn to draw and these books teach you! Do you have great ideas but cannot express them visually to your own satisfaction? 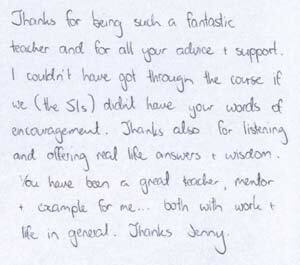 Are you a teacher who would love to be able to pass on some genuinely valuable skills to your class? Are you a teacher who needs a full set of class exercises that are simple to follow? Do you often procrastinate, putting off your projects because “it’s just too hard”? Do you have difficulty transferring the image you see in your mind's eye onto the page in front of you? Do you often wonder if there is a better way to teach yourself or your class how to actually draw and better still to enjoy the process? Do you feel that your artworks are just not good enough to display with confidence? Do you worry that your poor drawing skills may make your designs look unprofessional? Do you often sit staring at a blank page wondering where to start? You see, the trouble is, you may never be taught how to apply skills that get the results you want. And without the proper training, the end result is often dissatisfying, and sometimes downright embarrassing. Every one of my students faced the same frustrations as you - because they were never taught a structured process, such as that used to learn your A B C to make drawing enjoyable and satisfying. I'm constantly amazed when I go into the class room to train graphic design and illustration students in technical or commercial illustration, at the number I see whose work is lacking the basic skill of applying the media - they look unprofessional and poorly planned with no confident use of the pen. "I wish I could draw. I just don't know where to start." "Trying to put my ideas on paper takes me so long to do." "I want my paintings to look professional but my drawing skills lack confidence and I know this is the basis of a good painting." "I can't draw. I've always wanted to but I wasn't taught how at high school even though I took Art as a subject." "As a Graphic Designer, I never thought I'd be asked to draw by hand but at every interview I go to they ask what my drawing skills are like!" "As a teacher, art is a subject I dread because I find I can't teach something I don't understand myself!" "I've found that portfolios with fantastic hand-drawn artwork are the ones that get the great jobs but I'm hopeless without a computer." All you have to do is apply a proven, structured, step-by-step process, and follow a few simple rules. The mysterious thing is that once you begin to train yourself using this formula your own creative talent comes to life and you find your skills grow exponentially. It begins with something simple and becomes an exciting journey of your own discovery. Here's your ticket to discovering your own surprising drawing abilities. Let me share the 6 secrets of artist's skills with you. The internet's #1 guide: "How to draw with speed and confidence - The ABC of Art Skills". 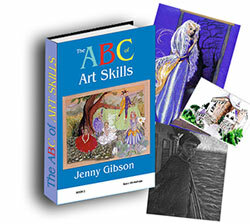 THE ABC of ART SKILLS is now available to you and everyone else who has the desire to draw with speed and confidence. Now it is no longer elusive. You see, we all can learn to draw knowing that this simple system has been proven and has a track record of success. After more than twenty years as a professional Graphic Designer, Illustrator and Instructor/Teacher I have put together an artist's start up system that begins at your level of skill. If you can barely draw a straight line, you can master these exercises. If you already have talent but need a grasp of the difference between amateur work and professional artwork you have found the help you need. All you have to do is apply a proven, structured, step-by-step process, and follow the rules. That's it. You will learn new skills that will travel with you for the rest of your life. Draw whatever you want whenever you want. For the past 18 years I've been teaching the Secrets of my Drawing Skills System to more than 2,000 people; students, teachers, business people, designers and illustrators across Australia. People like you who need to unlock their own surprising drawing abilities. After years of working professionally in this field I was approached by a publisher to write this series based on the popular workshops I created in answer to the demands of teachers, parents, adults and students alike. Now for the first time they are accessible to everyone! Here's your key to discovering your own surprising drawing abilities. 1. The 6 self-taught secrets to successful, professional art skills that have never been offered together before. 2. A step-by-step process that begins at the very beginning level of skill. Never again will you sit in front of a blank drawing sheet wondering where to start. 3. A complete set of black line master exercises that you can print out and make as many copies as you require for class use or your own practice. 4. How to spot good materials that do the job well to free you from buying things you don't need, in trying to achieve better results. 5. Notes to help you assess your class (or yourself!) before you begin and as you progress through the course. "The exercises in this system are simple enough for primary school age students yet valuable enough for university students and adults. This book is the first stage of learning. Even if you cannot draw a stick man you will find your skills improved dramatically once you have completed the exercises. Even if you need to create complex drawings with a high degree of difficulty you will find The 6 secrets invaluable. This is the chosen system to begin with for book illustrations, character animators, game developers, cartoonists, commercial artists and designers." The information this system contains has been adapted from my highly successful Drawing Skills Workshops. 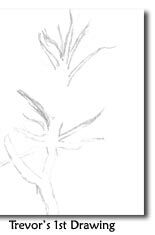 I've taken all of the best information from those workshops; information that has been simplified and refined over the past 18 years—and packaged it to become easy-to-use, step-by-step, self-paced drawing course. The books are filled with exercises, equipment tips, useful snippets, photocopiable black line masters, teachers notes and of course the step-by-step instructions. The ABC of Art Skills System. In fact, I invite you to use this program and put all the risk entirely on me. If at any time in the next 8 weeks you really give it a good go but feel that it falls short in delivering everything described in this letter, just let me know and I'll be happy to give you a full refund. If for any reason you're not 100% satisfied, I want you to demand your money back. You can even keep the entire ABC of Art Skills System valued at well over $300.00 as my way of thanking you for looking over the material. Now, if you're excited about the idea of being able to draw all those things you've always wanted, but are worried you won't be able to afford your own copy of my ABC of Art Skills System, let me put your mind at ease right now. Because this system is being made available over the internet I'm testing the world wide market and am prepared to offer this book for the remarkable price of $29.00 and not the $80 that is recommended. I would like your permission to offer you a special discount off my System if you order now! You can save $51 immediately off the original price of $80.00 and download my System right now for only $29! Please note: this special discount is only being offered during this testing phase. It can be changed at any time. However, I will honor the discount pricing on all orders that I receive in the next 24 hours. In fact, let me make it very simple for you to take advantage of this information right now. I'm going to give you three more FREE gifts to complete the system and the Template Kit, making this entire offer valued at over $300. To ensure that you get all the materials needed to get started and move forward, I will also include the second book in the series for Free. The retail price of this book is $54.95. I will include this book in your purchase today – FREE! because they are my books so I can, and you deserve it. I am offering as a special gift, for a limited time only. colour practice in exercise form. 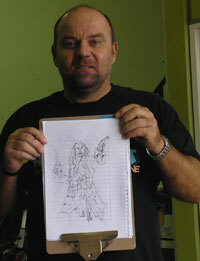 Your drawing skills will be vastly improved once you have completed these workshop manuals. * To celebrate the release of my second book in this series I am offering it as a special gift. Book B is based on two full workshops that take you from beginner to intermediate. These two books make a complete resource for You. This offer is to test the market so make the most of it while it lasts. In addition I will also include as part of this purchase - a Photographic Resource Kit. The Photographic Resource Kit contains a wealth of specially commissioned reference photographs selected personally by me so you can begin with professional tools straight away. 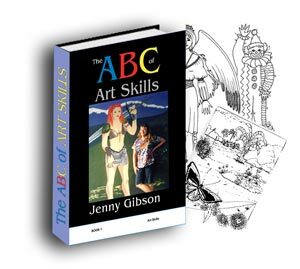 Valued at $97.00, you get the Photographic Resource Kit FREE when you order the ABC of Art Skills System. 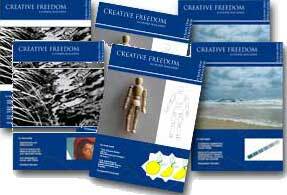 This valuable kit contains reference photographs which were specially commissioned to provide a visual resource for tackling the most difficult creative issues. Using the photographs will mean that you can immediately begin working on subjects that you know will train your creative mind. 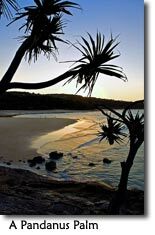 The Photograph Resource Kit includes instructions for using the photographs in your studio or class. These are valuable concepts that you may well have missed just because you didn't know what to look for. A quick reference guide to design principles to help you with your layouts for drawing, painting, desktop publishing, interface design or any type of graphic arts you may ever need to do. This invaluable guide saves many of hours of study. This white paper has a research value of $72.00. Extra bonus for purchasing today. A year's subscription to the "Lesson a Month" Club. Once a month you receive an exercise designed to improve your skills in specific ways. Exclusive to people who purchase the books today, these simple to advanced exercises are specifically what other artists, teachers and students have asked me to create for them. Full of "how to" exercises to improve your paintings, drawings, cartooning, sketching and illustrating. Act now to be sure you get your free subsription! 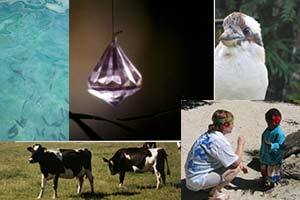 Buy on-line with Credit Card by Secure Server. You'll be redirected to our order page on Clickbank, which means that you have the advantage of Clickbank’s secure processing. Once processed, you will be granted immediate access to begin downloading your course and FREE bonus material! To order now, click above to pay by credit card. We accept Visa, MasterCard, American Express, Discover, Eurocard, Visa-Debit, MasterCard-Debit, and Novus cards. Note: You are ordering a downloadable product (Adobe PDF), which means you will be able to start using the System within minutes of placing your order! 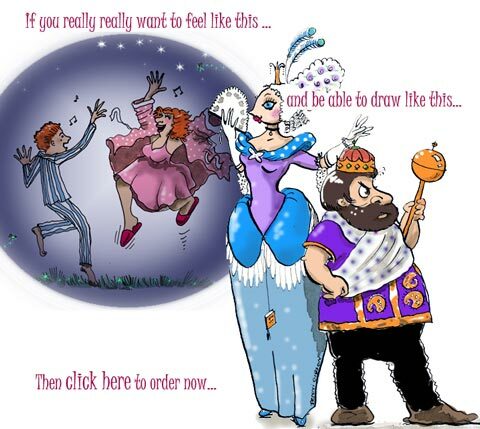 If you want to be really good at drawing then end your frustration – get these workshop manuals now and you won’t have any regrets - and you will be drawing in minutes. So are you wondering ‘Will these books work for me and teach me to draw’, the answer is without doubt - YES – 2000 students can’t be wrong – so start right away. P.S. Don't forget, I'm taking all the risk... If after trying my System you don't find a wealth of extra drawing skills, I'll refund every penny. And remember, you'll be able to download the system immediately. Five minutes from now, you'll be on your way to a one-on-one class with a professional illustrator! P.P.S. If you think the price of these manuals and lessons is too good to be true, you are quite right and the price is scheduled to be adjusted up in the near future. So do be quick.